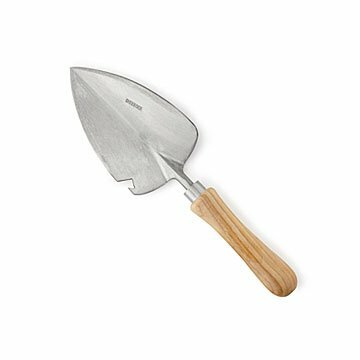 Hand-forged by a century-old Dutch family business, this high quality trowel's up for both work and play. If this top-notch trowel placed a personal ad, it might read: "Non-stop, all-around garden helper who knows how to work and play." Hand-forged from stainless steel by Jaap Sneeboer and Family, a fourth-generation Dutch company, it's a serious, multi-function gardening tool that will help with planting, transplanting, weeding, and other garden tasks for a lifetime. But it's also got a clever cut-out for post-gardening relaxation: a bottle opener, designed in collaboration with a local brewery. Roots down, bottoms up! Comes in a giftable cotton drawstring bag. Handmade in the Netherlands.